udio equipment manufacturers have long been struggling to build amplifiers that don't impart sound onto the music. Some have also worked toward making whatever sound they do impart enhance the music, but since they cater to users with all sorts of musical tastes, it's a losing battle beyond niche markets. As I have before, I turned to the past to see what earlier technology had to offer. And what do you know, we've already had a large assortment of amp-less music. Music boxes have been around for a while, but for the most part they had expensive media forms and typically lacked the ability to play back the human voice. Enter the golden age of the phonograph. Cheap media, large sound, and affordability made this mainstay of the early 1900s soar. I decided to buy one. 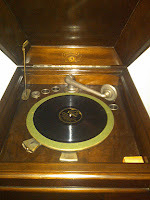 The premiere maker of phonographs was Victor with their Victrolas. Sadly, I haven't found a model from Victor to fit my decor, but I recently found a Columbia Grafonola circa 1920s that fit the bill. What surprised me the most was the level of sound this machine can produce with no amplifier! I have to keep the "volume" set to low in order to keep the neighbors from complaining. It takes a little bit to get the "equalizer preset" straightened out to make the sound just right, but once "configured" it's good to go with just about any less-than-compact disc. The records have gone up in price a bit since the '20s, but there's some great stuff out there. I found a few operas (well, opera aria since the time limit per record is somewhat short), lots of Foxtrots, some amazing 1930s vocals, and some WWI era "help the boys over there" tunes. Even some poetry readings. The bottom cabinet has slots to vertically store a number of records in numbered slots. The one semi-bummer is that the needles need to be replaced quite frequently - well, if you care about your records. 5-10 plays max. The needles had to be soft enough to read the music without etching their own groove and destroying the music. I was told by the guy who sold me the machine that there's a guy in MA who makes and sells needles. So you order them in bulk, and continue enjoyment of the machines. The one I got is known as a furniture model, in that it is a self-contained, floor-standing item. There are table-top models as well that have an external horn that are amazingly beautiful. They're more expensive (fewer were made) and sadly I didn't have a table to put it on. They also lack volume control. According to a few sources I've read online, the Victor machines are the best followed by some "B" class makers (such as Columbia) followed by a wide array of "C" class makers. Some people price these all as the same, but they do not command the same values and do not sound alike. Huge fun! I'd highly recommend it. And when we get hit by an EMP your friends will be hanging out at your house since you'll have the only music in town outside of hiring an orchestra. So have a look around and find one you like. There's hoards of styles available - something for everyone. And I'll leave you this evening with a tune from one of the Greats - "Fats" Waller - Until The Real Thing Comes Along. (Click play at right) Played on my Columbia Grafonola, of course. Awesome - LOVE that you worked in a reference to EMP.